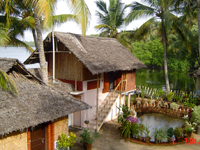 Kadalkkara lake resorts set on the banks of the cherai lake,offers cosy tatched cottages build on the stilts of eight feet height to give an unbroken view to the silky lake.The clear breeze from the lake and sea traveling through the grooves cools the room naturally. Your day starts at the east,enjoying from the bed seeing the colourful scenic beauty of behind the golden clouds the sun shining,the sight of the exotic local fishermen in their canoes fishing or deep diving. During monsoon you can enjoy the spectacular sight and thrill of the roaring rain and music of the thrizzling rain laying in the huts with gods in god`s own country. 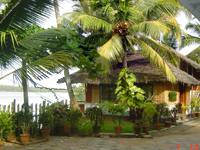 Our facilites include well furnished mini conference hall,where you can conduct all kind of meeting ,family meetings,birth day parties.you can also enjoy,beach games,fishing,boating and back water cruise etc. We arrange sight seeing trips as per your requirement.